Originally conceived as an MP3 music player, the iPod has gradually become an all-purpose multimedia player, capable of playing music, videos, movies, podcasts and other media content, all of which are available via iTunes software and the associated iTunes Store. Photo capabilities started to be added in 2004, with the launch of the iPod Photo, giving newer iPods the ability to store and view photos. Some of the more recent iPods, including the fifth generation iPod Nano, have even included video cameras, allowing live video to be captured. It costs $178.96 to make a 16GB iPhone. The most expensive part of an iPhone to produce is the touch screen, at $35. The first iPod was released in 2001. Technological advances have seen battery life improve with consecutive models of the iPod. For example, the claimed battery life for the first generation iPod is a maximum of 8 hours, compared to a quoted 40 hours for a fourth generation iPod Touch. Apple provides detailed guidance for iPod owners to maximize their iPod battery life. Like all rechargeable batteries, iPod batteries degrade over time, and are only expected to hold full charge for a limited number of charge cycles. The full range of sounds, on average, for an iPod is 120 decibels. The first iPod ever made had 5GB of capacity. In France, it is illegal to play your iPod louder than 100 decibels. By 2006, the iPod had sold over 41 million units. The very first iPod came complete with a simple game called "Brick," and a limited range of other additional functions, such as the ability to store addresses and other contact details. As the iPod range has developed, each new model has incorporated a range of extra functions to compliment the device's music and media capabilities. All iPods can be used as "mass storage devices," in place of an external hard drisk drive, to move data between computers. In 2006 Apple started to make a small range of additional games and programs available for iPods via the iTunes Store. 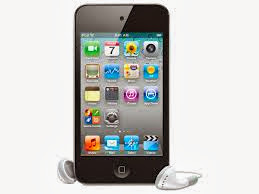 Users of the touch-screen iPod Touch now have access to a vast library of software, applications and utilities, as the iPod Touch uses Apple's iOS operating system, in common with the iPhone. iPod batteries can last between 14 - 28 days if they are not used at all. Depending on the model of iPod, the battery will continuously play music for between 8 - 20 hours if fully charged. A vacuum has been released which has inbuilt iPod speakers. The world's most expensive iPod costs $231,776. Apple, the brand that makes iPod's, was created in 1976. The iPods computer program, iTunes, was released in 2003. The second generation iPod, released in 2002, was the first to be compatible with Windows-based computers as well as the Apple Macintosh. Until 2003, when USB connectivity was added, all iPods used FireWire connections to connect and synchronize music. USB connectivity resulted in the devices becoming natively compatible with more computers. The free iTunes software is used to synchronize music, video and other media with iPods, and is now available for Mac and Windows platforms; prior to 2004, Windows PC users had to use MusicMatch for synchronization, as iTunes for Windows had not been released.